Otosclerosis is a condition that can lead to hearing loss. It occurs when your small bone in the middle ear (stapes) becomes stuck in place. Frequently, this occurs when your middle ear bone tissue grows around your stapes in a manner it shouldn't. Your stapes bone needs to vibrate in order for you to hear properly. When it doesn't, sound can't travel to your inner ear from your middle ear, and it makes it difficult for you to hear. The ideal otosclerosis definition would be: The term otosclerosis comes from "oto" which means "of the ear," and "sclerosis", which means "abnormal body tissue hardening." Abnormal middle ear bone remodeling causes the condition. Bone remodeling is a lifelong action where bone tissue replaces old tissue with new tissue to renew itself. In the condition, this abnormal remodeling interrupts the ability of sound to travel to the inner ear from the middle ear. Over three million people in the U.S. have otosclerosis, according to the National Institute on Deafness and Other Communication Disorders. Many otosclerosis cases are believed to be inherited. Middle-aged, white women have the highest risk. If at any time you've had measles, then it can increase your risk. if you had a stress fracture to bony tissue surrounding your inner ear, then it can also increase your risk. If you have an immune disorder where your immune system attacks parts of your body mistakenly, then it can also increase your risk. Genetics play a role in inheriting the condition. 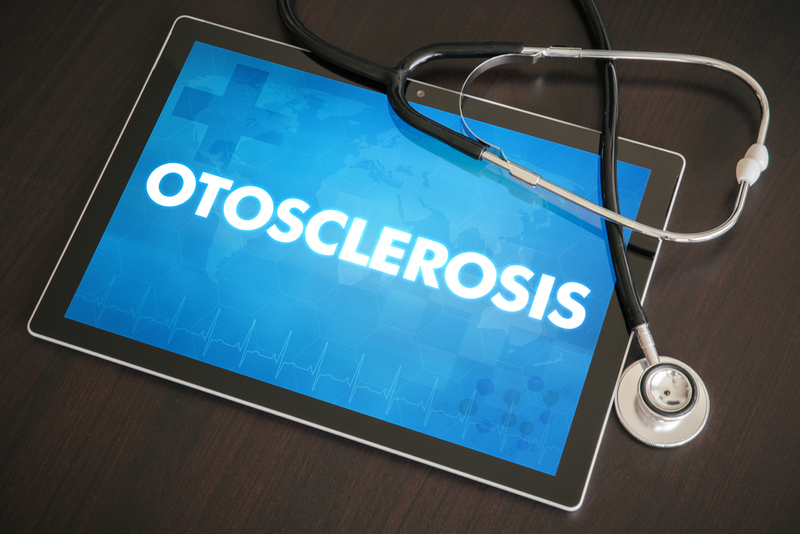 There's some evidence showing gene mutations that affect your collagen could contribute to otosclerosis development. Researchers are still studying genetic causes of the condition, but research does suggest that if one parent has otosclerosis, there's a 50 percent chance of each of their children also inheriting the condition. Caucasians have higher chances of developing it — around 10 percent, actually. It's not as common in other groups and extremely rare for African-Americans to develop it. Another cause, not fully clear, is pregnancy-related hormones which could lead to developing the condition. Existing otosclerosis while pregnant often becomes worse, and because of this, there are theories around the avoidance of supplemental estrogen or estrogen blockers that could be beneficial in cases involving an excess of the estrogen hormone. Hearing loss is the most frequent of all otosclerosis symptoms. Hearing loss often appears gradually. Many individuals with the condition first notice they can't hear whispering or low-pitched sounds. Most individuals with otosclerosis experience loss of hearing in both ears. Around 10 to 15 percent experience loss of hearing in only one ear. You may have tinnitus with otosclerosis, which is the sensation of ringing, hissing or buzzing in the head or ears that accompany many types of hearing loss. Otosclerosis typically starts at a young age. You can develop the condition between the ages of 10 and 45 years old, but it's more likely you'll develop it in your 20s. Otosclerosis symptoms are usually at their worse during your 30s. An examination by one of our Houston ENT doctors is required for ruling out other conditions or health problems that could cause the same symptoms. Your hearing health care specialist is trained to find, measure and rehabilitate hearing impairments and related problems. The ENT physician or audiologist will use a range of tests and procedures to assess your balance and hearing function. They might produce an audiogram (graph showing an individual's hearing sensitivity) and a tympanogram (graph showing how well the functions of the middle ear are for conducting sound). You don't do anything for the condition. This isn't the type of condition where something can be done early to prevent progression and there's no "cure" that will eliminate the underlying inner ear bone growth. Many individuals aren't especially troubled by their symptoms and therefore decide they'd rather wait and have a hearing test conducted every once in a while to see if the condition is progressing. Unfortunately, there's no medication that can reverse otosclerosis's effects. In some patients with progressive injury to the inner ear, fluoride treatment could be helpful in preventing symptom progression. Fluoride might strengthen the bone of the inner ear similar to how it strengthens teeth. It isn't, however, helpful for "conductive" hearing loss stapes immobility causes. You must take the fluoride daily over a long period of time for it to be effective. It most likely works by turning the active, bone-damaging "otospongiosis" lesions into a less active "otosclerosis" scar. Fluoride therapy's side effects are few and you can minimize any stomach upset by taking the fluoride with meals. Because fluoride is readily embodied into growing bones and teeth, larger doses should typically be avoided in pregnant women and children. Most people with otosclerosis can benefit from hearing aids. Most individuals with the condition have a "conductive" hear loss from a stapes bone mobility problem. Usually, the inner ear works very well, meaning a hearing aid could help increase the sound vibrations level enough so sound can typically get to the inner ear allowing the inner ear to make use of the information appropriately. Hearing aids aren't for everybody, but they can often be safely tried to see if patients will benefit from them. Surgery is often a highly effective otosclerosis treatment. Surgery for otosclerosis is referred to as a stapedectomy or stapedotomy. The surgery is used for "bypassing" the fixed stapes bone part. The surgeon removes it and then uses a new, mobile prosthetic bone to replace it. In the surgery, the surgeon removes part or all of the stapes bone with either a micro-drill or laser. They then place a tiny "piston" between the incus (second bone of hearing) and the inner ear. In some cases, the surgeon takes extra tissue from the external ear to help seal the inner ear opening. Individuals who undergo otosclerosis surgery typically go home on the same day of the procedure. The surgery takes around one to two hours and most individuals can resume normal activity after around a week. It typically takes four to six weeks for the ear to heal completely and for hearing to improve. Surgery can only assist with the "conductive" hearing loss part (that from the stapes bone immobility). It can't help hearing loss of the inner ear. Like with any surgery, some risks are linked with otosclerosis surgery. You should discuss them in more detail with the surgeon. Around 90 percent of patients experience hearing improvement after surgery. In around eight percent, the inner ear becomes a little worse and they can still use a hearing aid or hearing remains unchanged. In around one to two percent, the hearing loss may become worse. In rare cases (around one in 100), the inner ear can stop working entirely which means a hearing aid can't be used. Sometimes, additional surgery might be necessary. Researchers are conducting studies to enhance understanding of otosclerosis, including genetic studies for identifying the genes that could cause this condition. Other researchers are studying the efficiency of amplification devices, lasers used in surgery and numerous stapes prostheses. They’re also studying and developing enhanced diagnostic techniques. If you’re experiencing one or more of the otosclerosis symptoms described above, request an appointment through our contact us form or call us here at Houston ENT & Allergy Services at 281-649-7000 for an evaluation.